In the beginning there was just a single a FritzBox as wifi access point and it was good. Only two stories up in the bedroom I did have a flaky Wifi network at times. So I decided to put a wire in the bedroom and put a 20€ Satechi minirouter in there. Cheap thing, but doing it’s job fine - it is a bedroom with just my iOS device charging there at night. Now that I had two access points (same wifi network, same password, different channel) in the house, things started to get weird. I was connected to the access point further away for no good reason and I had miserable connections sometimes. Why is the network bad with more access points ? I had set up everything correctly. I was only using channels 1,6,11 and using 20MHz wide channels to not interfere with my neighbours. I read about Wifi roaming then and found out that the devices decide on their own which access point to use. iOS devices are particularly clingy however. iOS devices stay as long as they see an access point on it. They will only change the access point when they don’t see it anymore. So when you are moving in the house they stay too long on the access point they connected first with. You can purchase wifi systems that kick the device from an access point when the wifi controller sees that the devices are closer to another access point. My neighbour has one of those and I’ve heard no good things using them with iOS/OSX devices from him. It seems that sometimes the devices get kicked from an access point but try to stay with that one and that creates troubles. I then read about Zero Handover from Ubiquiti devices. They use the same WiFi channel to create a single network for the devices. The wifi devices see only one access point and the access points figure out (on the ethernet side) which device to talk to from which access point. I heard good things about them and have had good experience with a 6km Wifi connection with a ubiquiti nano station in the past. So I bought two of them a UniFi AP and a UniFi AP-LR. I put them in the same location as the Fritbox and the Satechi router previously. Then the dropouts in Skype and Facetime began. The picture would freeze and only get better after a couple of seconds. Nothing that bad I encountered in my house before. So I began trying to figure out what was going on. I tried to find comparisons on the net and they all were very high level. 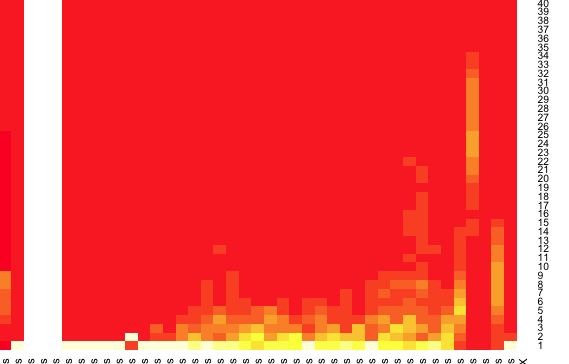 Maybe a speed test at max, but nothing describing my use case. I only need halfway decent performance (cause when I need speed I just use ethernet) but perfect quality of service. leaving it alone for some time I could see traffic dropouts. No traffic for some seconds. My ssh shells pipe even broke sometimes. I decided to venture more into network testing then. I created my own test installation then. A Mac mini connected via ethernet running as iPerf server. 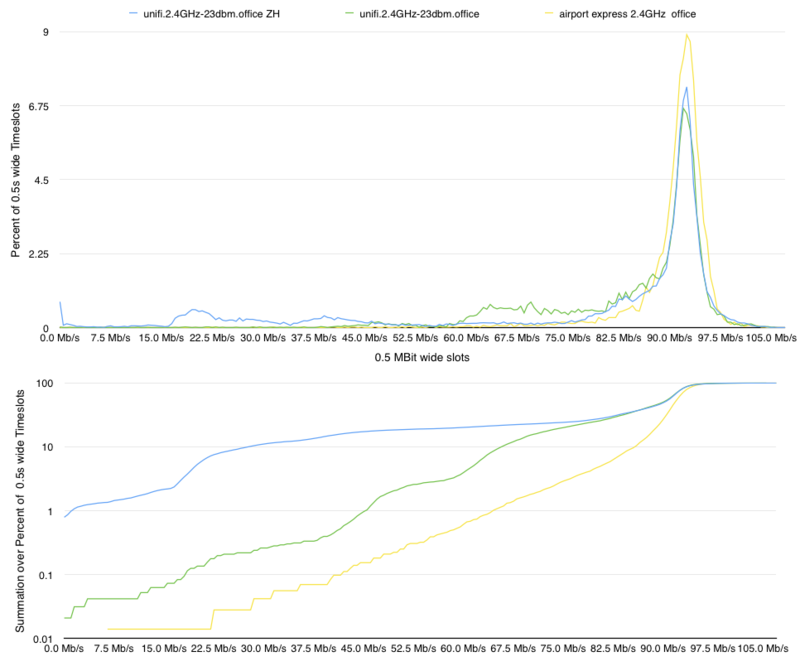 A MacbookPro Retina as iPerf client connected to the Wifi access point. The office Macbook is located in the the room below my bedroom, so there is only one ceiling in between, distance about 4-5 meters. 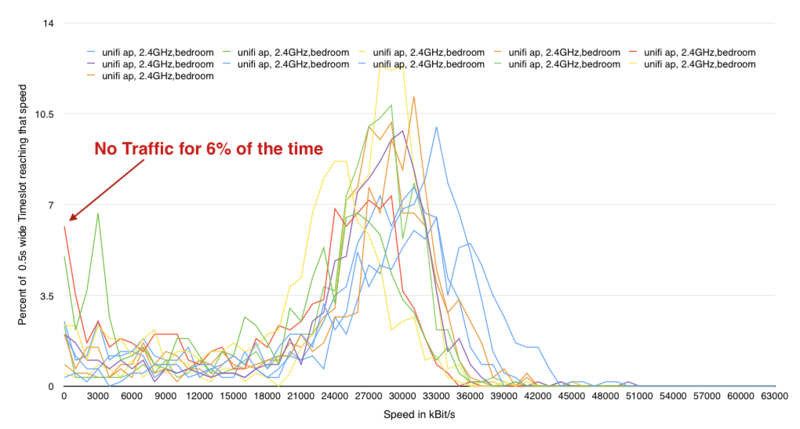 I can see that the maximum speed is about 50MBit and there are dropouts that go down to almost 0 Bit/s as it seems. So I thought about better visualising what I got and wrote a script that just counted the time-slots for each speed record. 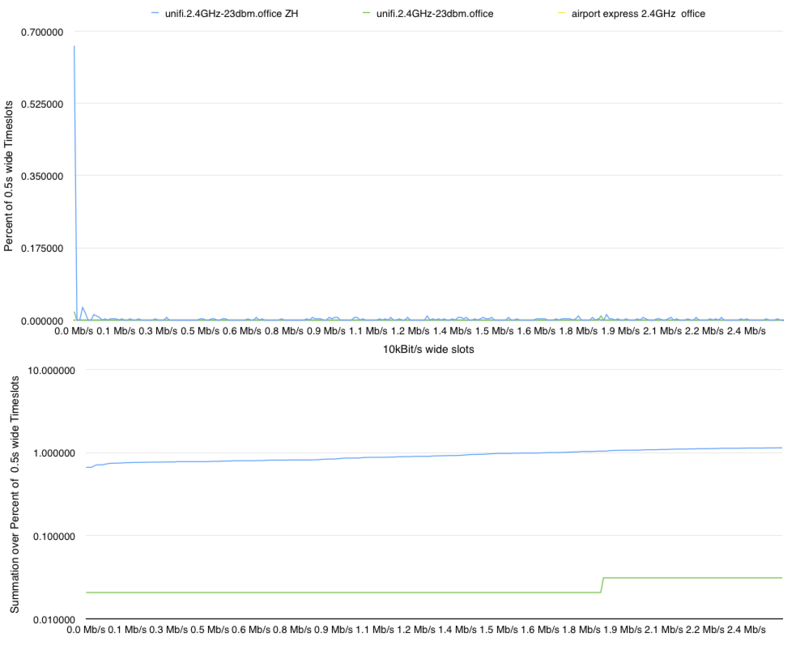 As you can see I would get about 6% of the time NO packets through at all in half hour long measurements. So that’s were the dropouts in Skype and Facetime come from. 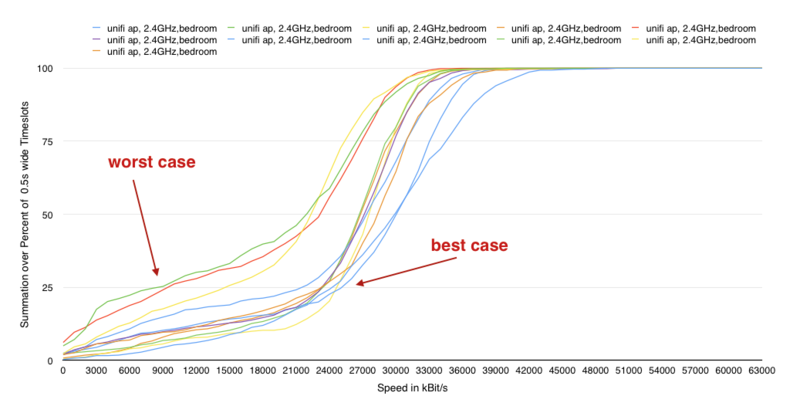 So this now means that 25% of the time the traffic is below 8-9 Mbit/s in the worst case (green line) and below 26MBit/s in a best case scenario. 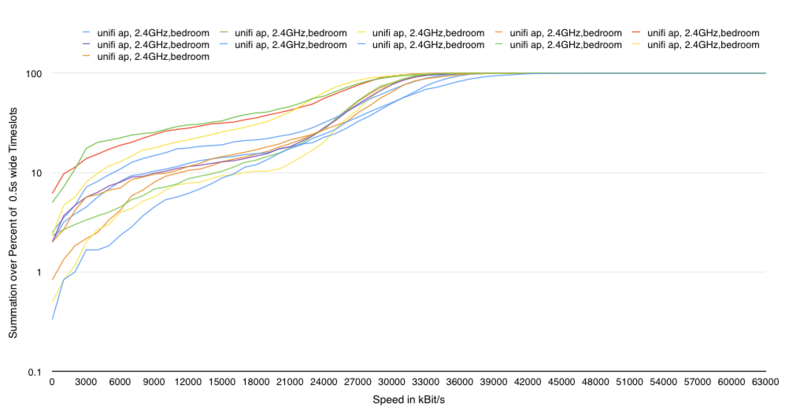 The results for the Unifi improved now that it was in plain sight of the MBP. 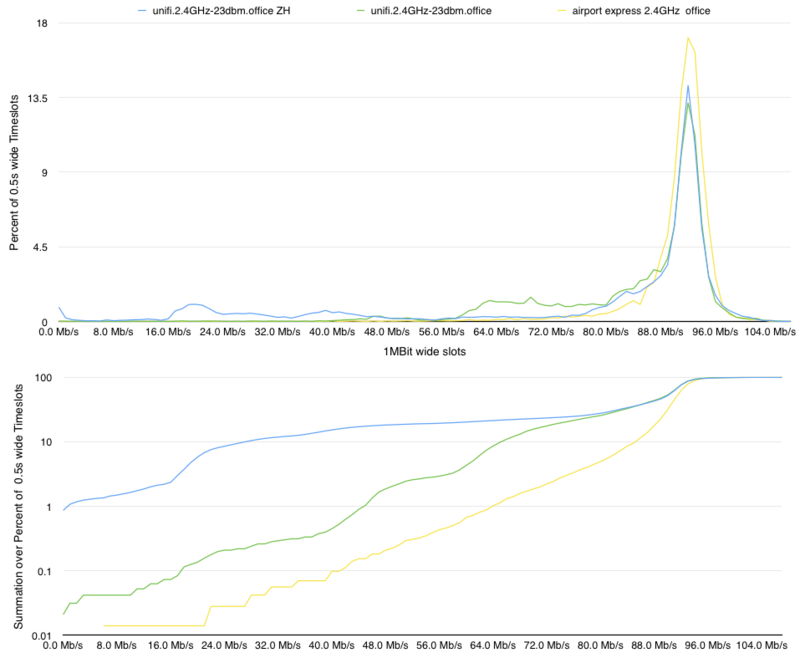 I then halfed the slot size for the counting from 1Mbit/s to 500kBit - as you see the percentage graph differs now , but the summation graph just stays the same, except getting a better resolution. Zooming in with 10kBit wide slots you see the peak at 0.66% for ZH where there is traffic below 10kBit - so no traffic at all. Performance improved without ZH as one would expect. Using ZH you get .66% of the time with no bandwidth. In a 15minute voice call you have 6 seconds of no bandwidth - and that is when you are directly beside an accesspoint. As I did have a Apple Airport Express at hand, it tested that as well. Not unexpected the Airport Express did a very good job at connecting to the MacBookPro: a fantastic minimum bandwidth of 6.5Mbit/s. So - I presume it does make that difference when you are the manufacturer and adjust your hardware to each other.